One of the great things about being a member of gastronomic society La Chaîne des Rôtisseurs is the opportunity to enjoy a special dish, meal or experience before it becomes available to the public; or in some cases would never become publicly available. 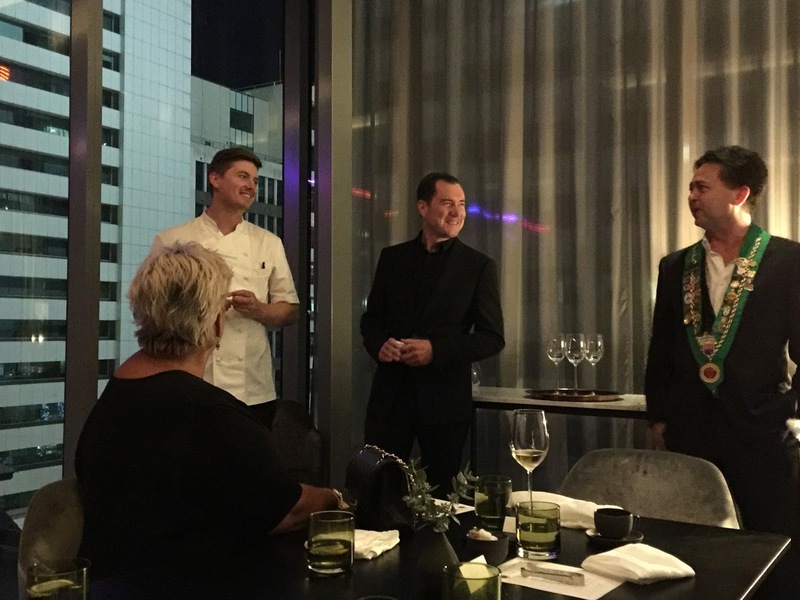 One such example was the farewell dinner at renowned Perth dining venue Jackson’s just before it shut its doors, where Chef Neal Jackson liked some of the dishes he created for the dinner so much that he incorporated them into his final degustation menu for the public. 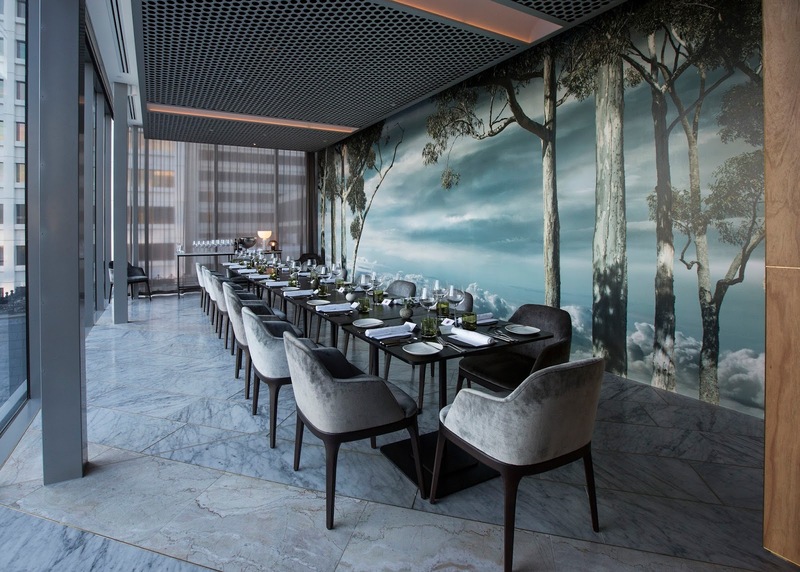 Another example is the La Chaîne Dîner Amical at the latest fine dining restaurant to arrive in Perth: Wildflower, located in Perth’s newest boutique hotel COMO The Treasury in the Perth CBD. 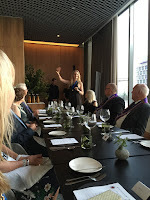 Held on 21 January 2016, it took place mere weeks after the restaurant had first opened. 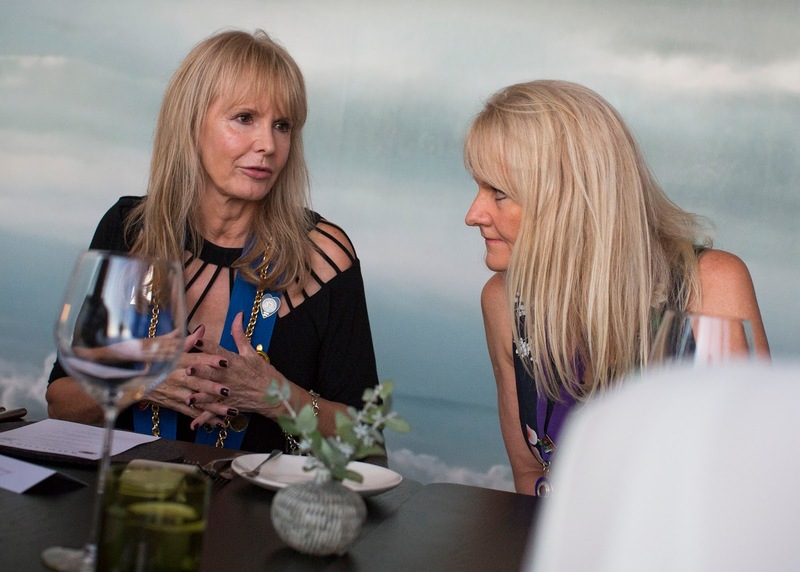 At this dinner, Executive Chef Jed Gerrard rolled out a 5 course degustation experience featuring dishes that were not available to the public. 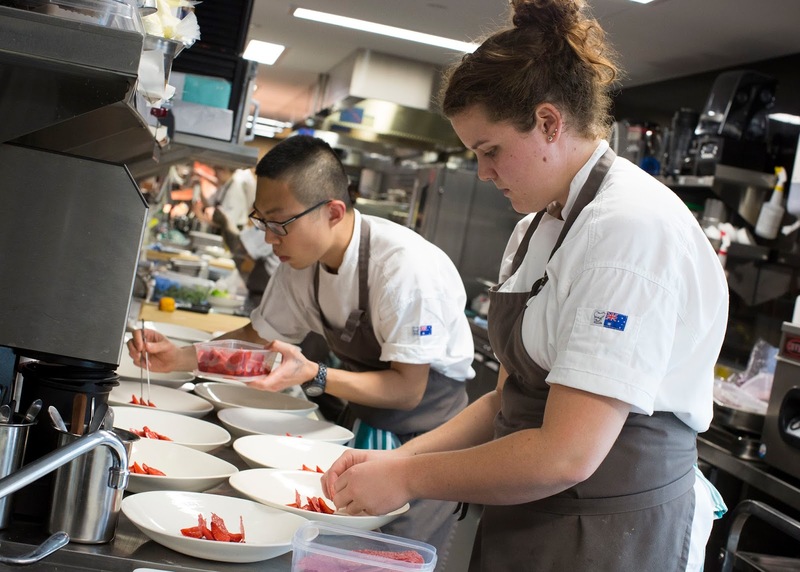 A Balingup boy, Chef Jed grew up a few hours’ drive south of Perth but before Wildflower, he had spent his entire career elsewhere in Australia and the world working with culinary greats like Tetsuya Wakuda and Teague Ezard, as well as at Michelin-starred restaurants in France and Switzerland. 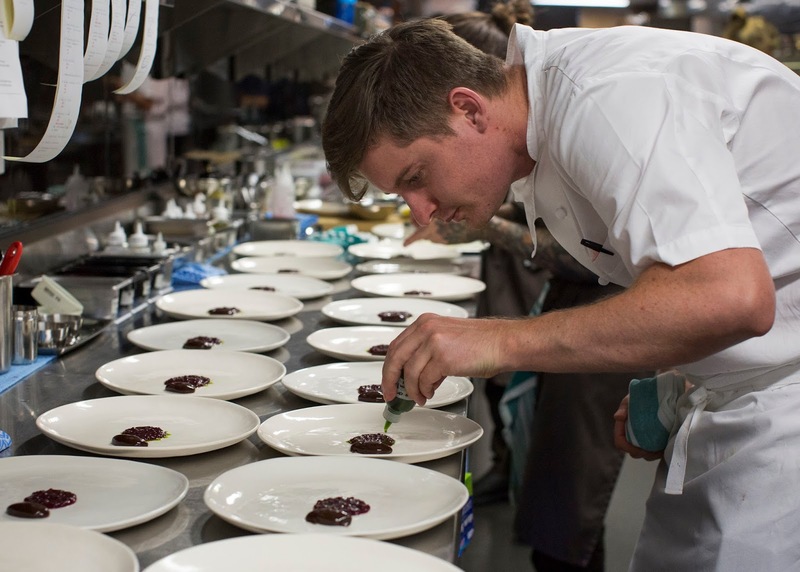 He told us that he had always wanted to return to work in his hometown but there were few opportunities for the kind of haute cuisine he wanted to practise, so he jumped at the opportunity at Wildflower when it presented itself. Chef Jed and his team spend their day off foraging for wild flora – from greens and flowers picked from open fields and found along the Western Australian coastline – to enhance their truly special and delicious culinary delicacies. Wildflower itself is also something different. 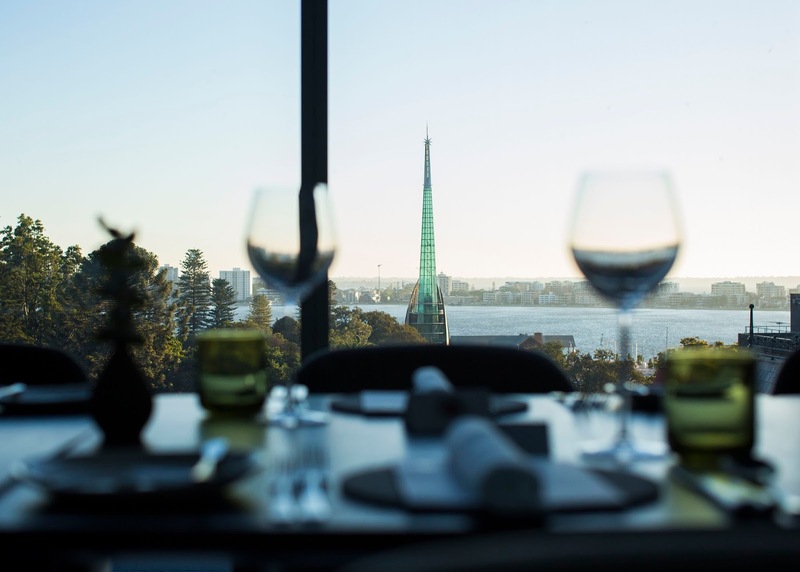 One well-travelled diner was overheard remarking that the venue made him think he was somewhere in Europe rather than Perth. 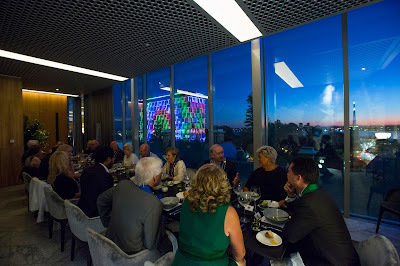 The expansive covered balcony, where we enjoyed pre-dinner Taittinger Brut with bite-sized morsels of raw fish garnished with caviar-llke finger lime vesicles perched upon a prawn crisp, was also something special, overlooking the Supreme Court Gardens and the Bell Tower at Barrack Jetty, and presenting a 180 degree view of Perth City around it. The private dining room seating 18 was spacious and well appointed, featuring floor to ceiling windows along the South wall where we enjoyed the magnificent sunset and the beguiling lights of Council House (which incidentally uses energy efficient LED specifications developed and introduced in Perth by Heritage Perth Inc., a not-for-profit organisation of which I am proud to say I am one of the co-founders and a former Board member) and a beautifully dreamy composite photographic mural by Melbourne artist Valerie Sparks along the North wall. The highlight of the evening was of course the food. A five course meal featuring only fresh Western Australian produce looked nothing like what you would have expected from their descriptions. 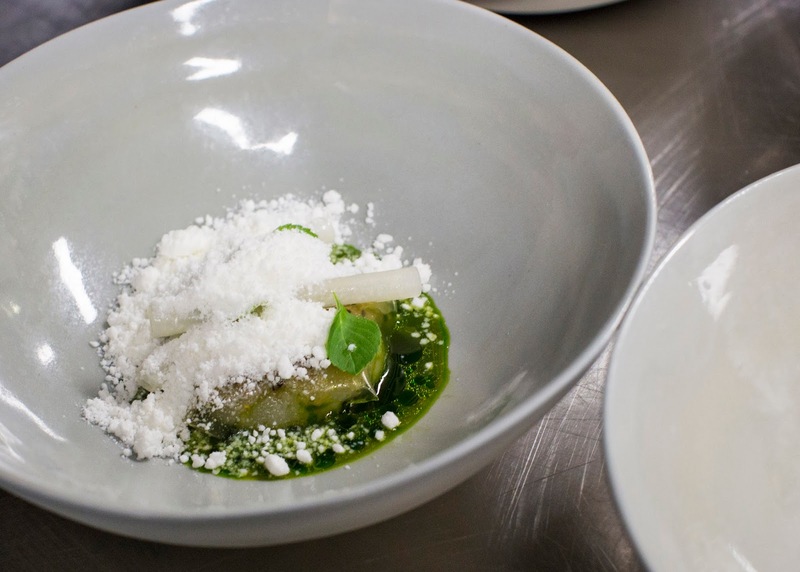 The raw scampi from Point Samson looked like a winter wonderland indundated with dry powdery snow of frozen horseradish milk in a pool of wild fennel juice; an intriguing combination of flavours, textures and temperatures. The kangaroo fillet cooked over jarrah embers with native thyme, onion and blue berries drew more exclamations of surprise. With an uncharacteristically medium rare appearance and soft and tender texture (as anyone who has ever tried to cook kangaroo will tell you, anything more than a slight searing on the surface will result in a gamey and chewy experience), gaminess was non-existent. 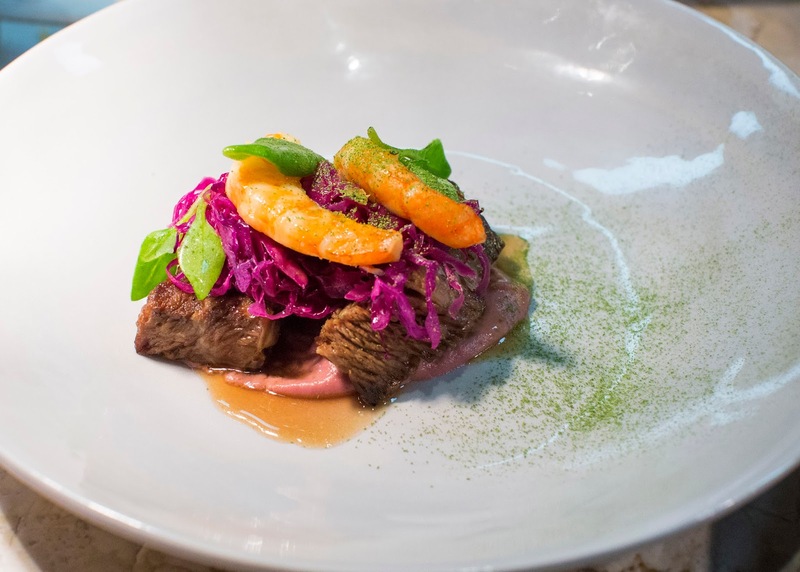 The soft and richly flavoured beef short ribs (without the bone), topped by firm and succulent Shark Bay prawns on top of fermented red cabbage and beach-foraged leaves was another symphony of complementary flavours and textures which gave new meaning to the concept of “Surf n Turf”. 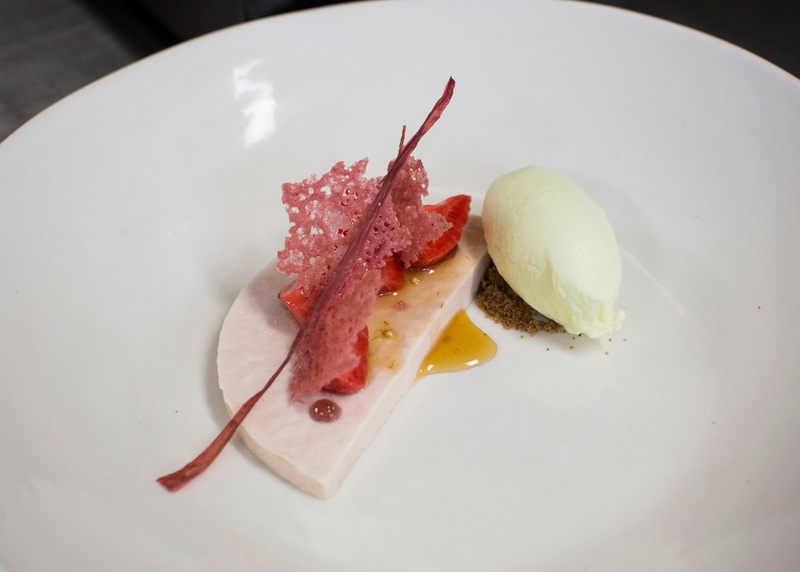 Dessert was an innocuous sounding but utterly delicious rhubarb mousse accompanied by strawberries poached with pepper berries and a sorbet of river mint (yes, mint foraged by the riverside), provided a delicious (but not overly sweet) and refreshing end to the meal. While the food was sourced exclusively from Western Australia, the accompanying wines ranged far and wide, from Bordeaux to Tuscany, from the Hunter Valley to the Yarra Valley; selected by Maître D'Hôtel David Best (formerly of Rockpool and who invited La Chaîne to dine here), whose team executed a flawless performance in delivering the courses and ensuring that wine glasses were never left empty. My favourite was the classic Mount Mary Quintet, one of the 21 wines found in Langton’s top tier “Excellent” classification (in good company with the Penfolds Grange and the Henschke Hill of Grace). 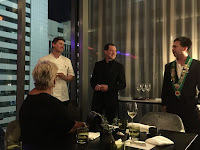 At the end of the evening, we enjoyed the traditional La Chaîne presentation of the Chef and front of house team, including a question and answer question where Chef Jed expounded on his cooking philosophy, which drew inspiration from the six seasons observed by the indigenous Noongar Wadjuk people upon whose traditional lands the City of Perth is located. With no start or end date to each season, the passing of each one is something that is felt. The Noongar people ebb and flow with the changes of Western Australia’s environment, letting nature guide them. Plants and animals have a special purpose in the changing of each season and the Noongar traditionally hunted and gathered different types of food based on these seasons. The creation of every dish at Wildflower celebrates the local resources. We were in Birak (the “first summer”), which is when the winter rains subside and the temperature starts to become warmer. Chef Jed also answered questions on how some of the dishes were prepared, but never fully giving up all of his secrets, as it should be! 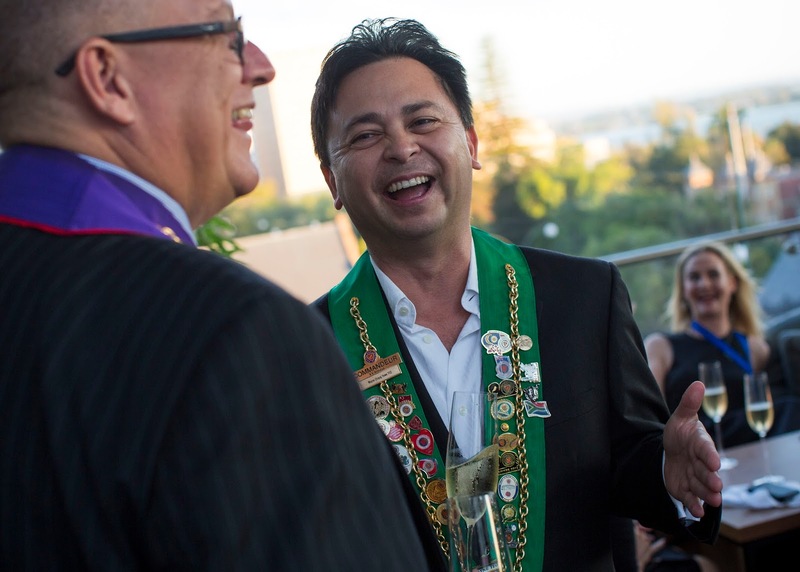 – before a La Chaîne plaque was presented to Wildflower as a sign of our appreciation for the special experience. That evening was made even more special by the fact that these dishes were “one-offs” – while Wildflower may have subsequently launched its five course tasting menu to the public, the dishes from that evening have not been replicated exactly as they were, reflecting the changing availability of produce, the change in seasons and the continuing evolution of Chef Jed’s culinary practise. 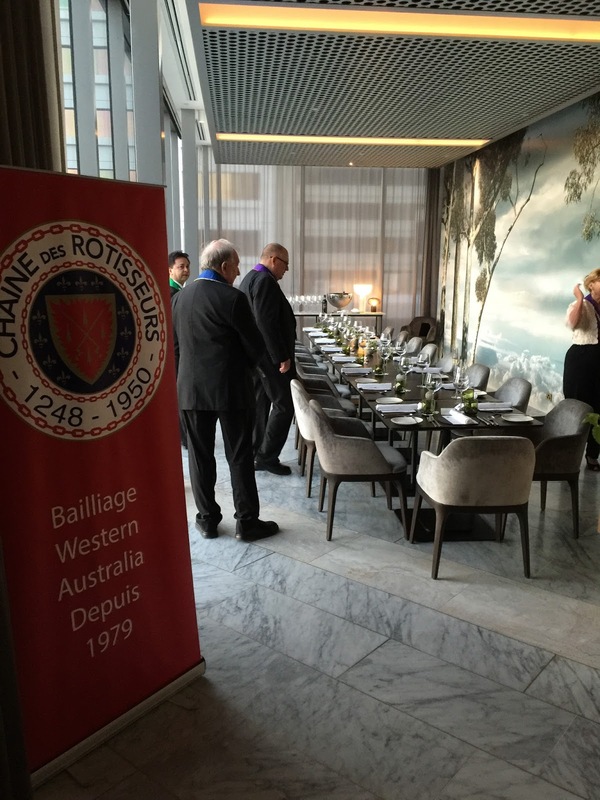 While the “official” part of the dinner may have ended, some La Chaîne members had enjoyed the evening so much that they opted to continue the evening, starting at the Wildflower bar featuring highly knowledgeable barmen and a respectable array of whiskies, and ending in the Petition Beer Corner at the bottom of COMO The Treasury, where limited run Australian craft beers were enjoyed as a “cleansing ale” to end the evening. P.S. I would like to thank professional photographer Matt Jelonek for giving me permission to reproduce his superb photographs (credited accordingly) in this article.